Whenever my husband and I are perusing menus and spot “bread pudding”, there is an unspoken agreement between us that we will split an order for dessert. It’s pretty difficult to make bad bread pudding, so we are seldom disappointed…This white chocolate bread pudding is a twist on a traditional recipe. I developed this recipe five or so years ago from one in our local newspaper. I have substituted brioche for white bread, adjusted the spices and flavoring, reduced the butter and sugar and altered the assembly of the pudding. Try to use the best white chocolate you can get your hands on. I ran out to our local Whole Foods and bought their only offering, “callebaut” a brand new to me at the time. This is a rich pudding that serves a crowd and is a popular dessert to take to a potluck gathering. 1. Preheat oven to 350 degrees. 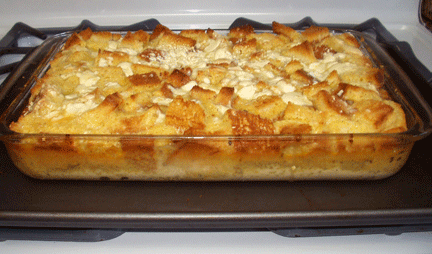 Place brioche cubes on a sheet pan and toast in the oven until crisp. (You can do this while the oven is preheating). 2. Beat the softened butter and sugar together. Beat in the eggs, one at a time. Add the warmed milk, vanilla, cinnamon and nutmeg. Add the cream. 3. Layer half the toasted brioche in a buttered 9 x 13 inch glass or ceramic baking dish. Pour half the custard over the bread. Sprinkle with half the chocolate. Layer with remaining brioche and press mixture into the custard. Add the second half of the chocolate. Finish up with the last of the custard and press down once again. 4. Bake for 40 minutes. Cool and serve. This looks absolutely delicious, Liz. I’ll be trying this soon. Thanks for sharing this recipe.